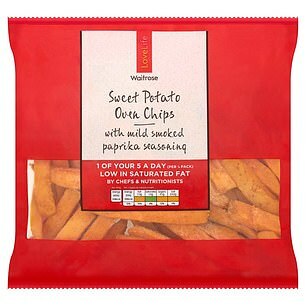 The recommended 80g portion of this mix of beetroot, parsnip and carrot chips provides a sixth of your daily fibre needs and 102 calories — half what you’d get from baked French fries — and is one of your five-a-day. There’s a teaspoon of natural sugar per portion. Beetroot is a good source of nitrates, compounds that may reduce blood pressure; and parsnips contain high levels of potassium, linked to improved blood flow. Carrots are a source of beta carotene, an antioxidant that protects cells. 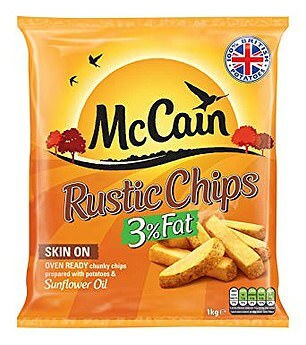 These chunky potato chips have at least 100 fewer calories per portion than fried chips — and the lowest salt, saturated fat and sugar content of the chips I came across. Potatoes are a good source of vitamin C, important for tissue repair; and potassium. Sunflower oil also supplies vitamin E, important for skin health. The potato skin is a good source of nutrients and fibre; you’ll get 10 per cent of your daily needs in a portion. Sweet potatoes have a lower GI than potatoes, so the sugar is broken down more slowly, making them a better choice for people with diabetes. They’re a good source of beta carotene, which is converted to vitamin A by the body and is important for the immune system and vision. Counts as one of your five-a-day. 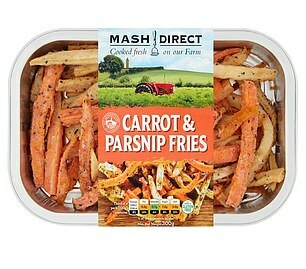 A mix of carrots and parsnips coated in rapeseed oil — a portion is one of your five-a-day. 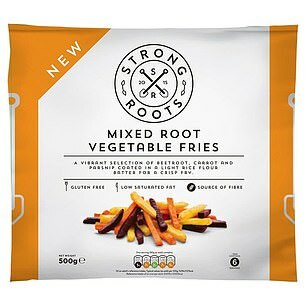 As well as fibre, carrots provide beta carotene, while parsnips provide vitamin C and folate, vital for red blood cell formation. Rapeseed oil is a source of omega fatty acids, important for brain function. Parsnips and carrots have a high sugar content, but this is outweighed by their nutritional benefits. 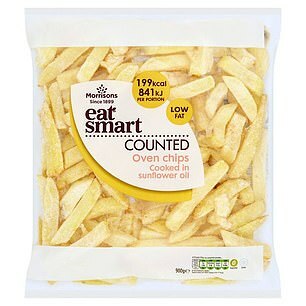 Made with potato and sunflower oil, these chunky chips are less calorific than other oven potato chips. They are a good source of vitamin C, potassium and vitamin B6, which plays an important role in metabolism.